R3: Ch1, turn. 2MC, 6CC, 12MC, 6CC, 2MC. R4: Ch1, turn. 3MC, 8CC, 6MC, 8CC, 3MC. R5: Ch1, turn. 3MC, 9CC, 4MC, 9CC, 3MC. R6: Ch1, turn. 4MC, 8CC, 4MC, 8CC, 4MC. R7: Ch1, turn. 4MC, 8CC, 1MC, 2CC, 1MC, 8CC, 4MC. R8: Ch1, turn. 4MC, 20CC, 4MC. R9: Ch1, turn. 4MC, 20CC, 4MC. R10: Ch1, turn. 5MC, 18CC, 5MC. R11: Ch1, turn. 5MC, 18CC, 5MC. R12: Ch1, turn. 6MC, 16CC, 6MC. R13: Ch1, turn. 7MC, 14CC, 7MC. R14: Ch1, turn. 11MC, 6CC, 11MC. R15: Ch1, turn. 7MC, 14CC, 7MC. R16: Ch1, turn. 6MC, 16CC, 6MC. R17: Ch1, turn. 5MC, 18CC, 5MC. R18: Ch1, turn. 4MC, 20CC, 4MC. R19: Ch1, turn. 3MC, 22CC, 3MC. R20: Ch1, turn. 2MC, 10CC, 1MC, 2CC, 1MC, 10CC, 2MC. R21: Ch1, turn. 2MC, 9CC, 2MC, 2CC, 2MC, 9CC, 2MC. R22: Ch1, turn. 2MC, 8CC, 8MC, 8CC, 2MC. R23: Ch1, turn. 2MC, 7CC, 10MC, 7CC, 2MC. R24: Ch1, turn. 2MC, 6CC, 12MC, 6CC, 2MC. R25: Ch1, turn. 2MC, 5CC, 14MC, 5CC, 2MC. R26: Ch1, turn. 2MC, 3CC, 18MC, 3CC, 2MC. R27: Ch1, turn. 1MC, 2CC, 22MC, 2CC, 1MC. FINISHING: Using the photo as a reference, thread a yarn needle with CC and stitch the antenae. I stitched on the front of the square, then flipped it over and stitched again on the other side. 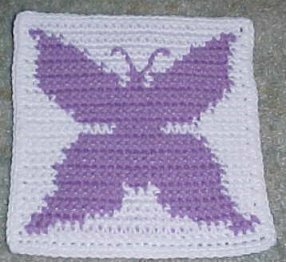 You could stitch through the square if you want to make the antenae on both sides at once.